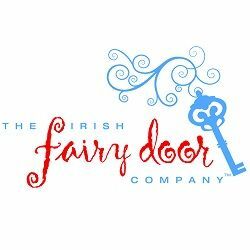 The Irish Fairy Door Company was specially selected by the Fairy Council to provide handcrafted fairy doors for all locations – be it your home, your garden, the office, school or care centre. Each fairy door is given a portion of magic so that your new fairy can come and go between our world and Fairy Valley. Did you know that there is a centuries old fairy fort just up the hill from where the fairy doors are made? It is a place imbued with magic and we believe that this is where fairies are born and come into our world. Each fairy is waiting eagerly to find his or her new home. Our doors are sent out all over the world, just bursting with magic and wonder enabling every fairy to find his or her perfect home and family. Only one question remains… Do You Believe? Irish Fairy Garden Accessories 4 pcs. Irish Fairy Playtime Accessories 4 pcs.